While it’s not three times as good as its competitors, Bingo3X is still better than average. We rely on our relationships with partner sites to keep our service free. We are either still in discussions or have failed to reach an agreement with Bingo3X. According to the people behind Bingo3X, the site’s USP is “fun and entertainment”, and they also claim 3X gives away more freebies than any other site. After launching in early 2012, Bingo3X swiftly scored a hat-trick of industry awards, including Best Boutique Bingo Site of 2012. As a member of the xCite network (to which Glitter, Smooch, and Satin Bingo also belong), 3X offers a little bit more than your average Dragonfish site, including an enhanced loyalty plan and xCite-exclusive promotions. So, can you expect triple the fun when you jump onboard? Let’s find out! Bingo3X has a striking appearance due to its unusual yellow-and-red colour scheme. 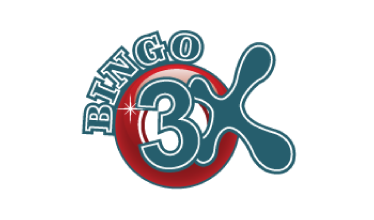 Its logo uses a red bingo ball with the brand name written across it, and the X of “3X” is shaped like a dabber. There are also three quirky mascots who look like a cross between Morph (the animated clay character who appeared on TV with Tony Hart in the 1980s) and aliens. Much of the top of the homepage is taken up with graphics advertising the brand’s three awards that were won in 2012, and although on the one hand, they’re impressive, on the other hand, they make it obvious that the site’s not won any further awards in the past five years. The rest of the page displays the current games schedule, the value of the game jackpots, and the most played slots. Overall, the website is decent enough, but it doesn’t do anything particularly special. You can contact the customer service team via the “Help” button on the main menu. Enquiries via email are usually answered within 48 hours, but if you need immediate assistance, you can telephone or visit the instant help room which both have agents on standby 24/7. You can grab a £15 no-deposit bonus if you enter valid credit or debit card details when you register. Plus, there is a generous 200% welcome bonus available if you’re happy to part with £10 and make your first deposit. The maximum you can claim is £100, and you must wager your bonus six times before you can cash out any respective winnings. As we mentioned earlier, Bingo3X is part of the xCite Network, which means that some of the promotions are standard Dragonfish offers and others can only be found at xCite bingo sites. There are seasonal specials throughout the year, Lazy Sunday where you can enjoy free bingo and cheap tickets, Saturday Night Fever which offers free games, free spins, and vouchers, The 2 Million Race (win up to 2 million loyalty points every month), and the Weekender – a promotion which gives away more than £700 in prizes every weekend. Sadly, like many Dragonfish sites, Bingo3X doesn’t run any of its own promotions. If you’ve played at Dragonfish sites before, you’ll instantly recognise the format of the website and lobby. You can browse the different game types using the various tabs, and you can see which rooms have chat hosts as well as how many players are currently inside them. The game screen is well-designed so that there’s plenty of room to view the chat window, play side games, and view your bingo cards (which are automatically sorted for you as the numbers are called). The bingo options are 90-ball, 75-ball, and High 5, and there are no additional or exclusive games or rooms. The Mobile page (which can be accessed from the main menu) explains how you can play via your smartphone or tablet. There’s an Android and iOS app, or if you prefer, you can scan the QR code directly into your mobile and visit the mobile-friendly site directly. There are nine regular rooms, four free rooms, three £1m rooms, seven Moneymakers rooms (which host special events like Grab a Grand, Sure Win, and Zodiac Bingo), three XCite rooms (Lazy Sunday, Saturday Night Fever, and Saucy Sunday), and four daily jackpot rooms. Despite the vast number of rooms, not all of them open 24/7, and there are only three bingo variants to choose from (90-ball, 75-ball, and High 5). The rooms aren’t unique to Bingo3X either, but on the plus side, you can often purchase cards for as little as a penny. The slots selection is OK, and there are plenty of progressive jackpot slots to try your luck with, including Millionaire Genie, Fluffy Too Mega Jackpot, and White Wizard. The banking options include Visa, MasterCard, Maestro, Neteller, Entropay, Paypal, Paysafecard, and Wire Transfer. Withdrawals take 48 hours to be processed, after which your withdrawal request should complete within two to five days depending on your chosen banking method. The cashier system is easy to use, and allows you to enter bonus codes where applicable. Because Bingo3X is a member of the XCite network, not just the standard Dragonfish network, there’s a loyalty scheme and a VIP club. The XCite rewards scheme has four levels, each of which allow you access to different rewards. At Level 1 (Rookie), all you get is access to free bingo rooms, but at the higher levels such as Pro and Champ, you can get up to 15% bingo cashback, up to 10% slots cashback, free game cards, free spins, extra loyalty points, activity bonuses, and birthday bonuses. If you qualify for the VIP Club, you’ll be notified by email, and on top of the standard loyalty rewards, you may receive reload bonuses, cashback, seasonal gifts, and invitations to VIP-only events. As Bingo3X exceeds expectations in certain areas such as loyalty and VIP treats, a good choice of payment options, and a reliable and easy-to-use desktop and mobile interface, but is let down by a lack of original promotions and interesting game variants, it doesn’t take our breath away. However, it does have a loyal following, and offers good value-for-money bingo and some decent jackpots. Have you played at Bingo3X? Leave a review and share your experience with thousands of other players. Never miss out on the latest news and offers. Favourite Bingo3X today!